The team travels forward in time to tackle one of the oldest time travel chestnuts in existence. The crew arrives in 2147, where corporations have taken over for the government and Vandal Savage has taken a Rasputin mentor role to a teenaged boy, Predegaton, who in five years will unleash a genocidal virus that will wipe out a large chunk of the world’s population and pave the way for Savage’s takeover. The team struggles with the relative heroicness of killing a seemingly innocent adolescent in cold blood or living with the consequences of what he is destined to do. 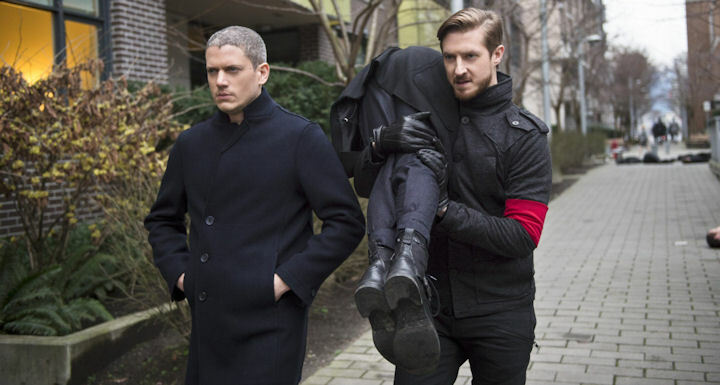 Despite Snart being all Team Murder, the Legends decide that kidnapping and displacing this despot-in-waiting from the timeline is the way to go. Their mission is further complicated when they discover Ray’s technology has been used to make automatons that oppress the people and will help in Savage’s rise to power. Rip learns the Armageddon virus already exists and Savage is already pushing for its use, over the objections of the current leader of this corporate state. The actual kidnapping goes off without a hitch, but putting the Joffrey Baratheon wannabe in an induced coma, does nothing to change the timeline. Rip wakes the kid up and whisks him away to a lakeside where he wrestles with his own feelings head on: Would he really kill a child for the chance to save the life of his own family? Despite his best murderous intentions, Rip can’t pull the trigger and eventually exchanges the kid for Sara. This indecision has terrible repercussions, because it spurs the kid to patricide and accelerates the timeline of Savage’s takeover. It’s not been a good couple of weeks for Ray. In the last episode he got pulled out of two years of marital bliss with Kendra in the 1950s to this week finding out his technology is being used to hurt people, his girlfriend is still hung up on the dead lover she’s spent 80 lifetimes with and that the discovery he made have left a love child behind when he left 2016. During the battle, Ray learns that it’s his brother who created both the killer robots and the progeny that created the society they now live in. Despite Kendra having flashbacks about her old life and family in the 1920s (how very Arrow of her), she tells Ray she loves the fact he has the personality of a Labrador retriever and wouldn’t mind some heavy petting of her own – if you know what I mean. *That Gideon is an amazing computer. I want to know more about Sara’s rollicking dreams with the nurse. * Heatwave/Chronos has been cooling his heels in the ship’s plexiglass prison and part of his punishment is that he’s become the crew’s sounding board, which is worse for him than being locked up. *Sara does her best to make Heatwave and Snart play nice-nice and make up. It ends with the former partners in crime beating the snot out of one another, but bygones are bygones now that the Time Masters think Heatwave is a traitor and is being hunted by a full-on murder squad from the future. “Oh good, we’ve gone from infanticide to child abduction. That’s … progress.” – Ray on the Catch-22 nature of this week’s mission. This show is still suffering some growing pains. Its two most troubling characters continue to be Rip and Kendra. It took some baby steps fleshing out Rip this week, but Kendra was still all over the map emotionally. Hopefully her decision to romance Ray can help her out. The big fight scene was one of the best they’ve had, mainly because it was quick. LoT is still looking to turn the corner, hopefully raising the stakes at the end of this episode will get that accomplished.